Container blueberry production on a commercial scale could become a reality now for many growers who do not have acidic soils. 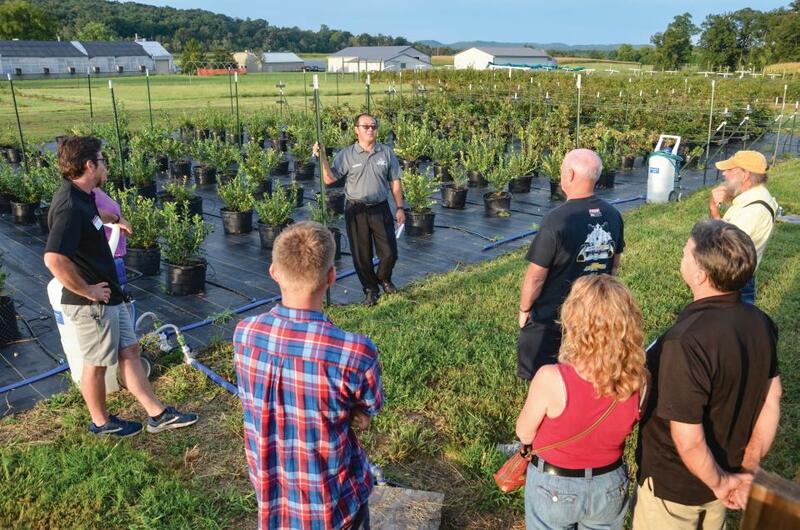 After three years of trials and tribulations at The Ohio State University South Centers through a Specialty Crop Block Grant Program in 2015 from USDA via the Ohio Department of Agriculture to develop and fine-tune a container blueberry production system, I am happy to share the good news with growers like Jeff and Cathy Thomas of Lincoln Ridge Farms in Van Wert County in Northwest Ohio. 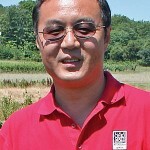 Even though container blueberry growing will not likely replace the production methods in leading blueberry-producing states, such as California, Georgia, Maine, Michigan, New Jersey, North Carolina, Oregon, and Washington, this technique will be attractive to many growers. 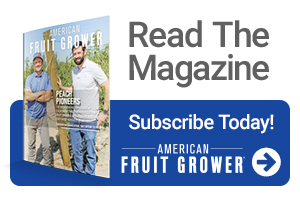 The good news is that quite a few innovative growers are already growing blueberries in containers in California and Florida in the U.S., as well as in other countries, such as Australia, Netherlands, and South Africa. In February 2018, I toured a sod farm with a sizable container blueberry planting in Ventura County, CA. It was certainly a beautiful sight! ‘Snow Chaser’ was one of the cultivars grown at this farm in Oxnard, CA, since they needed a cultivar with low chilling requirements. Steven Murray of Steven Murray’s Rare Fruit and Murray Family Farms in Bakersfield, CA, told me that a large fruit farm in Kern County, CA, has 200 acres of blueberries growing in containers. “We plan to start out small during the experimental stage and add as success and demand warrants to achieve 1 acre,” Jeff Thomas said. Here are some things you’ll want to consider as you start your trials. Container Type and Size: We have tried root pouch degradable bags, blow-molded resin nursery containers, grip-lip plastic containers by Nursery Supplies, McConkey 14-inch Square Color Planter, and Superoots Air-Pots. The final choice of the container type really comes down to cost and durability. In our study, most of our pots were blow-molded high-density polyethylene resin pots made by Haviland Plastics. We settled on 10-gallon containers since we wanted to see how the bushes will perform for seven to 10 years. Smaller containers (20 Liters or 5.28 gallons) were used in a study conducted in the Netherlands. With a set container size measured by volume, it makes more sense to get the flatter containers than the taller containers, since blueberry bushes tend to spread more horizontally than vertically. Potting Mixes or Substrates: We used 100% Southern loblolly pine-screened mulch in our study since it was readily available to us in bulk at a reasonable price and has a naturally low pH of 4.6. It is also a byproduct of the paper industry, thus making it a sustainable material. Even though this substrate worked pretty well for us, I wonder if adding 30% of peat moss would have made it perform better. Pure bark mix seems to have been too porous since nutrients and water drained very quickly. Several commercial mixes (or substrates), such as Legro’s Blueberry Substrate, PeleMix’s 3B BlueBerryBlend coir, or Galuku’s blueberry pot filler substrate are worth considering. Since I have not done any research on these commercial products, you should definitely do your own potting mix trial before you install a large planting. Speaking of a trial, it is very exciting to see that a graduate student at Oregon State University conducted a two-year study on potting mixes that consisted of coconut coir, Douglas fir bark, perlite, and peat moss, and several fertilization rates (Kingston, 2018). Fertilization and Irrigation: For fertilization of container blueberry production systems, we used a slow-release fertilizer with micronutrients. I am not sure we have found the perfect solution yet. You may need to talk with your fertilizer supplier since the release rates of fertilizers are dependent on irrigation rate, air temperatures, type of potting mixes, and many other factors. The quality of irrigation water is very important, too. Be sure to check the alkalinity level of your irrigation water. You will need to inject sulfuric acid if the alkalinity level is high. We found out the hard way after our blueberry bushes showed a lot of interveinal yellowing during the first growing season. After we injected sulfuric acid, the bushes greened up quickly and grew much better. Winter Production: In colder climates, blueberry bushes in containers could suffer damage to the roots if the blueberry bushes in the container are left out in the open without any protection. To protect our blueberry bushes, we placed our containers on their side and covered them with two layers of row covers. Even though we were quite successful in protecting our bushes that way, covering them for winter protection took a lot of time. In November 2018, we decided to sink some of our potted blueberry bushes into a raised bed lined with weed fabric. We hope this approach will save a lot of time and the blueberry roots will also be insulated and protected by the soil. It will also be interesting to see how long the bushes can stay in the pots. 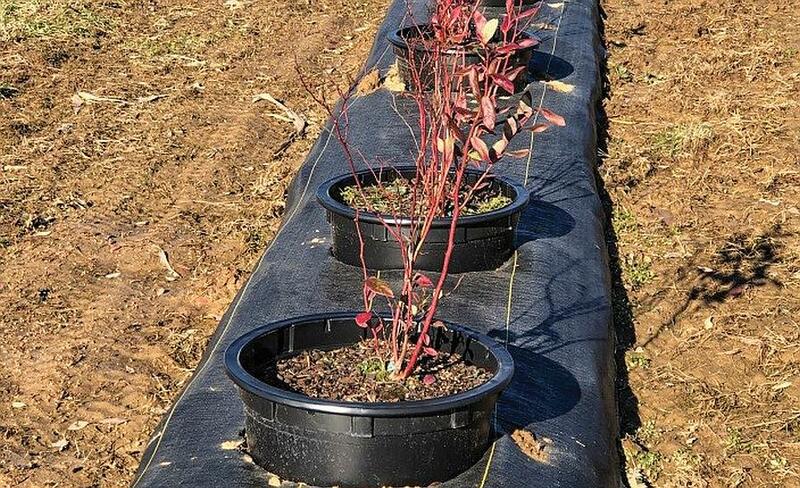 Blueberry production in containers can be a viable option for growers with alkaline soils in many parts of the U.S. Ten-gallon plastic containers worked well for us. Since containers vary quite a bit in cost and durability, and quite a few potting substrates are available, growers may still need to conduct their own trials of containers and substrates as well as fertilization and irrigation regimes. The first two to three years may be challenging. Things should get much easier once all of the parameters are worked out. I strongly believe that container blueberry production has a lot of potential even though there are a few challenges.